Use the Attachments function to add resource files to your document. This can be used to add not only images (.JPG and .GIF) to your document, but other resource files as well (e.g. .PDF, .PPT, .DOC, etc.). These instructions can vary slightly by browser. Please refer to our image guidelines at KB User's Guide - Documents Tab - Image Guidelines. - An individual image/attachment must be smaller than 125MB. - Multiple 125MB images can be attached to a single document, but each individual attachment must be smaller than 125MB. 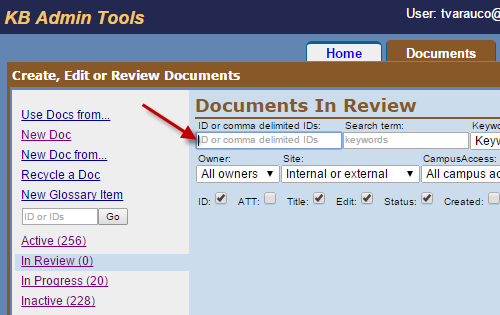 In the KB Admin Tools, go to the Documents tab and click on the New Doc link. A screen called, "Creating a New Document" will open. At minimum, fill in the four required fields marked with an asterisk (e.g. the Title, Keywords, Summary and Body fields). 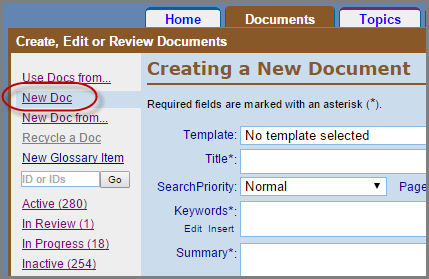 Go down to the Attachment part of the document editing screen and click on the check box next to "Create a new doc attachment folder". Once the document is saved, it is assigned its unique Document ID number and, subsequently, that document ID number is assigned to the Document attachment folder. Save Your Work: : Click on the Save Change button under the Body field. Your document will be saved to the Status of In Progress but will not be assigned a SiteAccess. By clicking on the Save Change button, you will not leave the document edit screen. Instead, you will see the following in the Attachment section of the editor: a link that says Open doc XXXXX attachment folder (in addition to the Draft saved, date and time stamp and the path to your new attachment folder. The image below shows that brand new document 69333, from our Test KB site, has a newly saved Attachment folder. Save As: Click on a specific Status button (e.g. In Progress, In Review, Active or Inactive) and then click on the Submit button. You will see a message that says, "Document XXXXX has been successfully created." along with two buttons to either View or Edit your document. The image below shows that document 46519 was created in our Test KB Site. You are now ready to upload images into your KB document. You will be immediately led to a screen called Documents In Review. In the ID or comma delimited IDs field, enter the document ID of the doc in which you wish to embed images and click on the Edit button. For more information about searching for a specific document, please review the KB User's Guide - Documents Tab - Searching for Documents. The image below shows the Documents in Review screen. A red arrow is pointing to the Document ID filter. Once you have located the document in which you want to add attachments, open that document in Edit mode by clicking on the Title, or, with the appropriate permissions, you will see an Edit button next to the Title, click on that Edit button. Click "Open doc XXXXX attachment folder" in the Attachment section of the document editor (just below the Body section). In the image below, we see the Open doc 69333 attachment folder link. Once you click on that link, an Attachment folder for document XXXXXX popup window will appear, click the Browse button to select images and/or files to upload. True multi-selection allows you to choose 500 files or more. A progress bar will appear and, very soon after, a confirmation of completion message. This feature is especially beneficial for those using a large number of individual files stored in multiple folder levels. You may create a sub-folder(s) within the Document attachment folder, should you want to organize your attachments by kind, version, etc. Simply click on the link, Open doc XXXXXX attachment folder link. A pop up window will appear with Choose and Upload buttons. Below that, you will see a Folder name: text box. Enter the folder name of your choice there and click on the Create Folder button. The image below shows that the folder, "Wind_Turbine_Images" is about to be created in our Test KB document, number 30009. Multiple sub-folder levels are allowed in attachment folder and there is no limit to the number of levels. A sub-folder name character limit exists so the file path can remain efficient. As you navigate through the sub-folder structure within the document attachment folder, the updated path will be displayed so you can accurately point to each file location. When viewing the entire attachment folder from the document edit screen, all the sub-folders are shown, but the word "Folder" will be appropriately indented to indicate on which level it exists. In the image below from our Test KB, the Document Attachment folder in Document 30009 has a sub-folder called "File_Attachment Folder". There are three images in that sub-folder circled in red. Clicking on the arrow next to the sub- folder name shows/hides the contents of that folder. The uploader in Firefox, Chrome and Safari uploads more files at once as well as larger files. Unfortunately, the current uploader does not work in IE, so IE will not have a multi-select feature and is still limited to 125MB files. Click Upload to save the images/files to the KB document being edited. Click the X button on the uppermost right side of the pop up window to exit the Browse screen. Uploaded files will appear under the Attachment section on the draft edit screen as soon as you finish uploading them—if not, click the Save change button to refresh the document editor screen. The image below shows two sub-folders. Under the sub-folders are two images, one is a *.txt file, the other is a *.png file. WYSIWYG Design Mode: A pop up box will appear that will give you the opportunity to provide a text alternative to succinctly communicate the purpose of the image for those using screen readers. After entering text in the text box, if you were to look at your image in the HTML editor, the image's title and alt value is now be populated with the text you provided. Should you leave this field blank, two quotation marks will appear as the value alt field. Screen readers will know that an image is in this place. HTML Editor: The HTML code for this image will appear in the the Body of the document and will automatically place the name of the image in the title and alt values. WYSIWYG Design Mode: A pop up box will appear that will give you the opportunity to provide a text alternative to succinctly communicate the purpose of the images. After entering text in the text box, if you were to look at your image in the HTML editor, the title and alt values of this image will be populated with the text you provide in this field. It is not optional to leave this field blank. Should you choose to leave this field blank and click on the OK button 3-4 times, the image will be placed, however, (again, if you were to look at your image in the HTML editor) the title and alt fields will display two quotation marks. Screen readers will know that an image is in this place. HTML Editor: The HTML image code will appear in the the Body of the document and will automatically place the name of the image in the title and alt values. It is not optional to leave this field blank. Should you choose to leave this field blank and click on the OK button 3-4 times, the image will be placed, however, the title and alt fields will will display two quotation marks. Screen readers will know that an image is in this place. WYSIWYG Design Mode: Clicking on this link will place the a hotlink with the name of the file in the Body of the document. (Example: CreateGAaccount.txt) . No.- designates the number of the attachments in the table. Icon- indicates the type of file extension. Name/View- gives you the name of the file, clicking on this link allows you to view the file. Size/Kind- indicates the size of file. Download- clicking on this link allows you to download this document to your browser. Rename- clicking on this link allows you to rename your file ***please manually add the file extension. In the image below, the rename link was clicked presenting a field in which to enter the new name. Please enter the file extension first, enter the new name of the attachment and click on the rename button. The image below shows the file extension already entered in the New name field. Move- you may move this image into your KB's Shared Documents folder and/or your KB's logo folder. Delete- Check the checkbox to indicate the file(s) you wish to delete. Click on the Delete Selected button at the bottom of the table to delete your file. Modified (GMT)- indicates the time and date stamp your file was uploaded in Greenwich Meridian Time (GMT). In docs- Clicking on the Show link displays document ID numbers in which this image appears. Should the image not be placed in a document, you will see N/A. To delete images or files in the this folder, simply click on the box in the Delete column and then click on the Delete selected button. Or you may click on the the Select all button if you wish to delete all the images and files and then click on the Delete selected button. To make a zip file of all or selected images/files, select the images and/or files you wish to zip by either clicking on the check boxes in the Delete column or click on the Select all button. Then click on the Zip selected for downloading button. The image below shows a PNG file,"esses". In order to zip this file, the check box next to the Delete box is checked (see red x). Then click the Zip selected for downloading button (see red box). A pop up message will appear saying, "A .zip file will be created for you to download. /Click on the OK button to continue. Once you have clicked on the OK button in the pop up message, a zip file with the file/files you selected will appear in the document attachment folder. 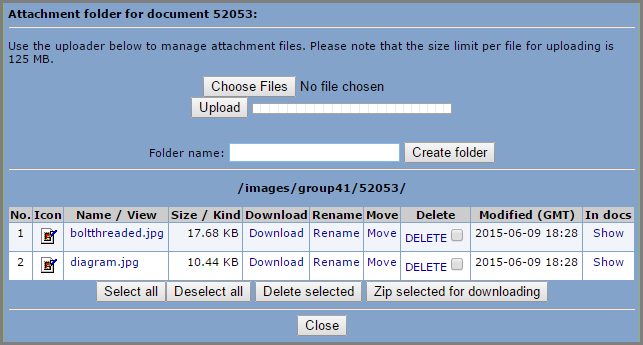 The image below shows the document attachment folder for 52053 from our test KB site. The zip file link is circled in red. You may place this *.zip link in either Plain text or have open in a New Window (NewWin). The *.zip file's naming standard is, the word Download, plus the date/time/second stamp (e.g. Download20150825182430.zip). Note: See KB User's Guide - Documents Tab - Insert an Image from another Website for more information about embedding attachments in documents. Why Does a Specific Image Appear Rotated in my Document? Use Case: A customer sent us a link of an image stored in their version of Box whose orientation was" portrait" (as expected), however, in their KB doc, the image appeared in "landscape" or rotated onto its side (unexpected). It turns out that a lot of image software will automatically rotate an image for you (based on the image's metadata), even though the image itself does not have the correct rotation. Unfortunately, this seems to be the case with most image software (including your Operating System, PhotoShop, Box.com, and others), so it's very difficult to determine that this is actually happening. Browsers, on the other hand, display the image exactly as it is, so you only see the incorrect rotation once it is embedded in HTML. The KB Team recommends an application that alerts you when an image may need to be rotated, instead of just doing it automatically, like GIMP (an image editor for Mac OS X).